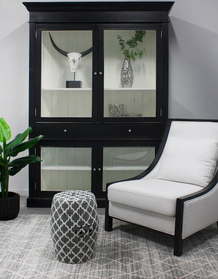 We love styling with the classic combo of black and white and here are five reasons why. It allows patterns to make a powerful statement. Patterns in general work really well in black and white especially on rugs, cushions and upholstered furniture. 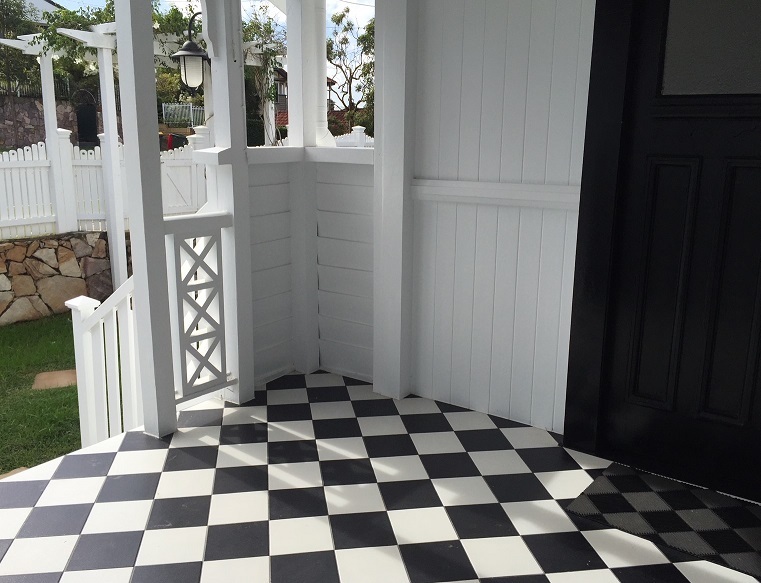 We absolutely love the black and white checker-board floor pattern we used on a recent project (image above). It makes a powerful entry statement complementing a classic home. It is versatile and complements almost all colour schemes. In some cases it can even highlight other colours in the space. Feel confident to mix black or white accents with reds, blues, pink, green, or yellow. It is classic and timeless. 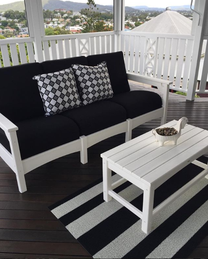 Black and white never goes out of style and is a good choice for those beautiful investment pieces that you intend to hold on to. It can decorate a space without creating clutter. 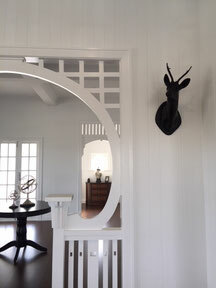 Black and white is very clever at creating clean lines and focal points in a room. For example, white decorative accents in a room with white walls creates interest without fuss. 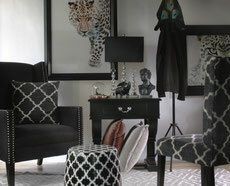 Alternatively, black and white lamps shades and patterned throws will look stunning in a neutral toned living space. Read on to view our beautiful range of furniture and accessories and be sure to visit our website for more information about our products and interior design service. Please don't hesitate to contact us at info@meadow-lane.com.au if you would like to get in touch. Whether you are entertaining guests or spending quality time with the family, your outdoor living space will become everyone's favourite room when you furnish it with our Club Sofa range. Engineered to withstand extreme weather conditions and harsh UV rays our range promises years of enjoyment minus the maintenance. We love it in black and white but there are other colour combinations to choose from as well. Our outdoor mats are both beautiful and functional. Made in the USA they are resistant to mold, mildew and chlorine. Also suitable for indoor use providing functionality underfoot. Looking for the perfect cushions to add the finishing touches to your home, whether it be for a daybed, window beach seat or throw cushion? 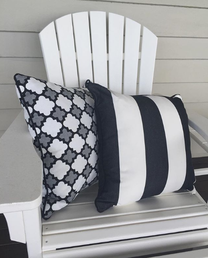 Meadow Lane custom makes beautiful cushions tailored to your specifications. 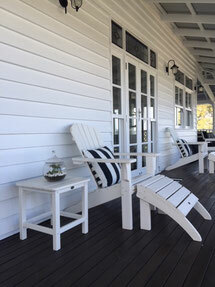 Made in the USA, our Adirondack Chairs are made from polyurethane and stainless steel. Unlike wood, our products are resistance to corrosive substances such as oil, salt spray, UV and other environmental stresses. This means you will be able to enjoy your furniture without having to sand, paint or stain as part of ongoing maintenance. Our chairs also come with a 20-year manufacturer's warranty. 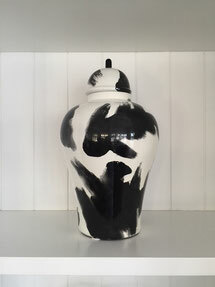 This ceramic black and white brush stroke temple jar is a modern take on the timeless ginger jar. 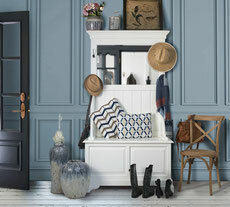 The perfect decorative accent for Hampton's inspired decorating with a modern twist. Looking for something special? Meadow Lane has access to beautiful and unique decorative pieces that will bring character and style to your home.. View our range online or engage our design service to help you source something unique. 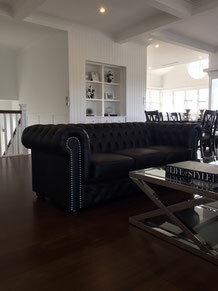 Our gorgeous chesterfield sofa is both modern and timeless in design. From its deep buttoned features to its generous proportions the Manhattan Chesterfield Sofa is a fine example of how a classic design can fit into modern surroundings. Shown here in genuine black leather with silver studs. This gorgeous display cabinet is handmade in Birch with a black painted finish. It features glass inserts on the doors and sides. VJ panelling and polished silver hinges provide a classic touch. This Hallstand with storage embraces the look of country charm. 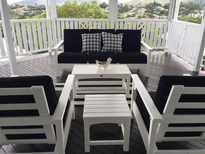 Designed with mahogany wood with an Architectural White painted finish . The hallstand has a convenient place to sit offering comfort and functionality. Each piece is individually crafted by hand using traditional techniques combined with efficient modern-day processes. 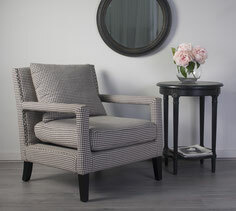 This stylish Avalon Armchair is upholstered in black linen and will work in both a contemporary or classic environment. Large polished silver studs are a smart feature and work well with the fully covered arms. This Stylish armchair is upholstered in houndstooth making a wonderful statement piece. The armchair will work in both a contemporary or classic environment. Large polished silver studs and black legs provide beautiful finishing touches to this piece.